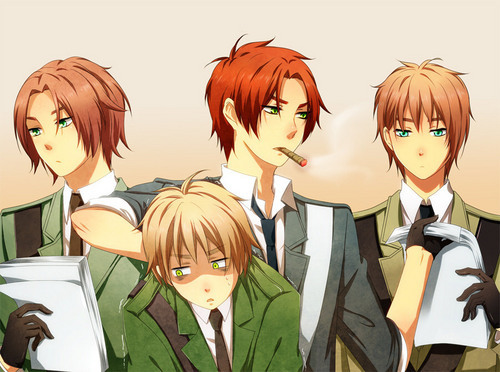 N. Ireland, Scotland, England, and S. Ireland. . HD Wallpaper and background images in the hetalia - axis powers club tagged: hetalia. Uhhh did you get this from my pictures?? Cuz if you did (or did not) you got the names wrong, its N. Ireland, Scotland, England, and S. Ireland.... ^^' Wales isn't in there. I think Scotland needs to be scruffier!! :P lol Good stuff! But where is my adorable Wales? Aww Wales is excluded? Maybe he was too bust shagging a sheep. i got two characters named N. Ireland & S. Ireland. England is definitely the cutest!!!!!! XD I'm doing Scotland for the World Friendship Meeting for girl scouts... Dear god the maps... OHONONON!! That is what england gets! Do you think either Ireland watches Roar? ahaha lol England X3 he's so cute ! and well, Scotland... WHY ARE YOU SO COOL ??? he's smoking and I love that detail ! I'm pretty sure there's no such thing as "South Ireland" on the world map. It's either Ireland or Eire. Pretty insulting, actually, to refer to the Republic as "South" Ireland. England is still my favourite out of all those countries.